What do you do when your cloud-based accounting software goes down? So, do you guys have any backup for this kinda situation? And if so, what do you use? Once a week we print out an 'every tenant' report and squirrel it away for situations such as this. We also have old fashioned paper receipts (with a carbon copy for the tenant) and will take everything. For credit cards we'll use the old fashioned slide card imprint thing, but you can use the old fashioned receipt and put the cc info on back and let them know once the power comes on you'll run it and they'll get their email/digital receipt then and you'll shred your copy of their information. I use Silelink too and experienced the same issues. I'll take cash or check payments and issue a hand-written receipt. I don't have the old-fashioned card swipe thing like Kris does, and most of my tenants will not allow their card numbers to be written on anything, even with a promise to shred later. Printing a report every week is a good idea, and I've thought about doing it, but never do. Probably because I'm not as busy as other facilities and it seems like a waste of paper and toner. The whole time Sitelink was down yesterday, I had one tenant come in wanting to know when he was paid thru. Well, yes, cash payments are easier to handle. And as for credit cards, then yes, me too, I haven't seen that swiping paper machine for ages. Plus I don't think our customers will feel comfortable with any of us making a paper copy of their card. Most people use chip-and-pin cards anyway and they even frown upon our antiquated setup with the electronic swiper, let alone doing it on paper. What I was mostly asking about is the way to use our database while offline? Is there a fallback app we can use for that? I am not the one who chose our accounting software. But when selling it those companies must provide some way to access our data while the Internet or their servers are down, don't they? As a wiorkaround I was trying to search with Microsoft Access to see if I can open it but I couldn't find any way to do it. If it's just an internet issue, you can work offline. It should be updated with most recent online activity and paid-thru dates so you will have some info to work with. One drawback is when you have internet again, any payments you did need to be entered again. If I remember correctly, new rentals can't be done when offline. I don't know if we can work offline with a server issue like we experienced yesterday. I didn't even try because I couldn't even get to the login page. I'm leaning toward Kris's idea of printing any necessary report(s) at the beginning of every week to have info on hand to give to tenants. Hope this answers your question. I tried calling support phone line and it told me "the line is not in service." So I had to email it. That is why I started thinking, "what are we gonna do if it never comes back." We are investigating a service disruption at our Raleigh data center. More information will be provided as it becomes available. I got that same message. Above is one of the emails I received yesterday about the outage. Since it affected their servers, and everything else, there would have been no way to access any tenant information. I'm sure it's possible to export a report to be able to access it elsewhere w/o having to print it; I've never tried it though. Usually, if you have no internet connection but try to log on, it will ask you if you want to work offline. In this case, we had no choice but to wait it out. I agree about printing a large report being wasteful, mine is 13 pages. That's a lot of toner and paper for something that I may never use that week. The Occupied Unit Report, for example, includes the following: unit #, tenant name, unit size, rent rate, lease date, & pad thru date. You could cross off those that paid, and easily count the number of days a tenant is past due just with the info listed. You could also print/export a vacant unit list. We can't do move-ins offline, but you would at least have some info to give customers. I hope this helps. 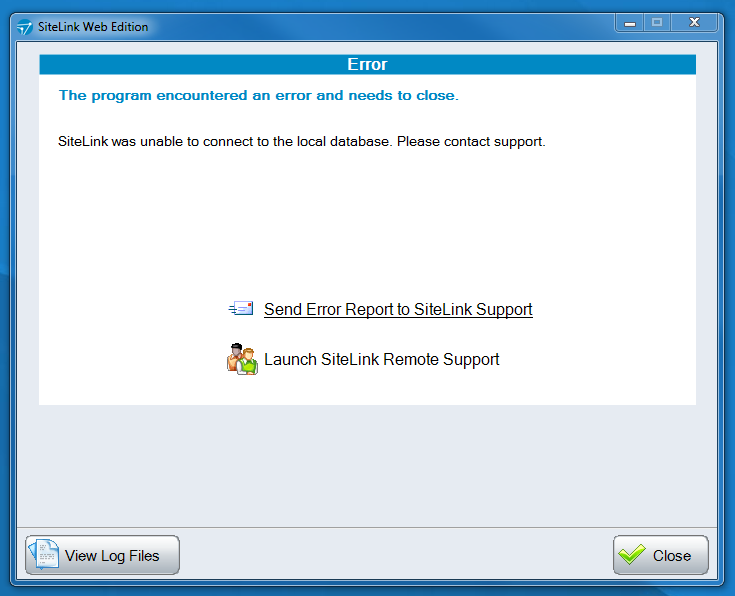 Yes, Sitelink is down again. Appears to be the same issue as yesterday as the email I just got is identical to the one posted above. Yay! The Raleigh data center has confirmed another networking issue similar to yesterday's event. Please do NOT force a live update and do NOT clear your site's local cache. This will not resolve the issue and will cause latency when once the data center resolves their networking issue. Continue to monitor status.sitelink.com for updates. I'll try to print the report you suggested. Hope it prints! By the way, Site Link users, any idea what's going on there? Instead of printing the report, you can export it. I just tried it, and it works best if you save it as a word document. You could do it at the end of every day, or first thing in the morning and have current information to work with. You could even do it with your past due report and vacant unit reports. Oh wow, thanks. Saving it in Word seems to be much better than printing. When printed it is quite cumbersome to use. It's sorted in some weird way, what looks like by unit number but then unit ten-one seems to be in front of one-one. Anyway, go figure. But most importantly in Word if you hit Ctrl+F you can search it by customer's last name or their unit number (which you can't do with a printed report.) It's not very user-friendly but at least better than nothing. you can open Notepad and swipe credit card into it. This way you can have the card number in notepad and copy-and-paste it from there later when the online payment is back up and accepting payments. I'm sure it's not what credit card companies will be happy about, but at least you can run a customer's payment and not alarm them too much about making a carbon copy of their card. PS. Just make sure to close that notepad window after you're done with it without saving it. 2. If you ran a credit card payment in Site Link and it got "stuck", like it was doing yesterday, it may still show the credit card number in a grayed out window. To save it go to Start in Windows and search for Snipping Tool. Then make a screen-grab with it. This way you will have a credit card number to re-run later when the service is back up online. Lastly, I'm still interested to know what's going on with their servers? If anyone learns anything please post it here. Is it STILL down? That's crazy! It went down again briefly. Same issue as Wednesday. Sure would like to know what it is that affects the entire system. Must have been connected to the nationwide Century Link outage? I was pretty disappointed with this outage. We were down as well. I remember one of the selling points of Sitelink web edition being able to use software even if the internet went down since a local copy was stored on the PC. This was definitely NOT the case at all since the software would crash/freeze just trying to login with no way to get around.